Great for jewelry making or investment. This is high purity gold with an assay of 87% - 92%+. Alaskan placer nuggets are generally 20K to 22K, or 84% to 92%. (#4 screen) The total weight: 5+ GRAMS The photos are a sample from the same creek; you will be happy. These nuggets come from the Fortymile mining district. 5+ GRAMS The photos are a sample from the same creek; you will be happy. Compare the weight in grams or ounces of the nugget to the current spot price of gold. Nuggets do fetch more than raw melted gold due to its rarity in nugget form. Remember, gold weight is most often listed in troy and metric values. The weight of gold can be measured in troy ounces, grams, or penny weight. (troy) = 31.10 g (31.1 grams). (troy) = 20 dwt (20 pennyweight). 1.55 grams = 1 dwt (1 pennyweight). 1.0 grams = 15.43 gr (15.43 grains). Be sure you know the difference between a gram and a grain! Some unscrupulous sellers will intentionally mislead you by listing the weights incorrectly with common abbreviations ("g" is for grams and "gr" is for grains). 10 GRAINS is equal to just 0.479 GRAMS. Remember it takes 15.43 grains (gr) to make just one gram (g) of gold. And there are 31.1 grams to one troy ounce. A grain is the smallest unit of measurement of gold. Are valued differently than raw gold and gold in coin form. When evaluating natural gold, consider several factors. Gold may be valued on: weight, rarity, physical dimensions, shine, brightness or luster, purity, origin, and whether the nugget is considered collector or specimen grade. Less than 2% of all gold mined is in nugget form. Gold nuggets are now rarer than diamonds. For an average quality nugget, weight and color are your best bets for determining value. Look for bright and shiny gold - if the gold is dark, it may contain a high amount of copper or other less minerals and metals. Pure gold looks just as you would expect. The value of gold is based on the karat system, which is a 24 point scale, signifying the percentage of gold a piece of metal contains. So, if jewelry is 14KT, it is 14 out of 24 parts gold, or 58.33 percent gold. Nuggets are usually 20.5 to 22KT purity (83% - 92%). Gold is tested either with acid or electronically. The acid test is the most reliable and commonly used method, yet can be dangerous due to the liquids used. This determines gold from base metals. This will show the general karat range, but is not completely accurate unless you are an experienced tester. Electronic testers are used often, but one thing to keep in mind is that these testers utilize a surface test and will only give you the karat of the actual spot you are testing. You will need to test in several spots to ensure that you didn't just get one particularly fine area of the nugget. No electronic tester can test gold dust or flakes. Therefore, the only true accurate means is a destructive fire assay test, which means melting the gold. View My Other Items For Sale. Add me to your Favorite Sellers. Chance of a mixup only occurs when multiple payments are made by one person. I'm happy to wait longer as long as you LET ME KNOW. Please do NOT panic if you have not received your item/s as quickly as you think you should have. You and I can see the same tracking information. I get lots of notes stating It hasn't moved from Anchorage in days! And one was stolen from the customer's mailbox. It's very rare for them to go missing. It will take a minimum of two weeks. Other countries, Priority package or envelope, is. Signature confirmation is NOT optional for foreign countries. Please wait until the END of the day to pay for all your auctions at once; then you will get a combined rate. Each side of the nuggets, silver and jewelery will be photographed, as I do not hide anything, including flaws, and will be mentioned if I see it. I will show each possible angle of the nugget/s, good, bad or ugly. A bit about me and where the gold is mined. Between 35 and 60 miners supply me throughout the state; some in Canada. I clean the gold by a natural process to knock off the dirt. The color and shine of the gold will vary, depending on the creek, assay, metal content, etc. I don't always know the creek where your gold comes from, but most of the time I do. From 2009 until now, gold is my full time job after a long career in aviation since 1977. I have gained the trust in hundreds, maybe approaching thousands, of return customers, including other sellers and plan to keep it that way. I also sell fine jewelry and custom made Alaskan nugget pieces hand crafted by my friend and neighbor, Jim. He is a talented jeweler and his custom pieces are one of a kind. I have a source for vintage Alaskan jewelry, but often I don't know the history of the item. When I don't know a certain stone, I will state that. Not for any obscure reason; it's as simple as that. It will always be relisted. Get images that make Supersized seem small. Tailor your auctions with Auctiva's. 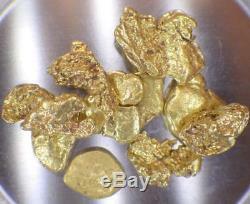 The item "GOLD NUGGETS 5+ GRAMS Placer Alaska Natural #4 Big Chunks FREE SHIPPING" is in sale since Wednesday, September 12, 2018. This item is in the category "Coins & Paper Money\Bullion\Gold\Nuggets". The seller is "judyjudygold" and is located in Salcha, Alaska.